We made it back home safe and sound and are all unpacked. We had a BLAST this past weekend. 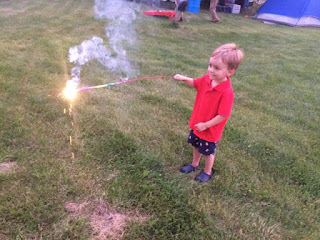 Ayden is old enough now to run around with his cousins, participate in fire crackers, truly enjoy fireworks, and tell us about his favorite parts of the trip (the kids!). It brought David and I SO much joy to witness it all. Ayden ran literally non stop all. day. yesterday and didn't get to bed until almost midnight. Social gatherings bring him so much joy and recharge our little extrovert to the max. 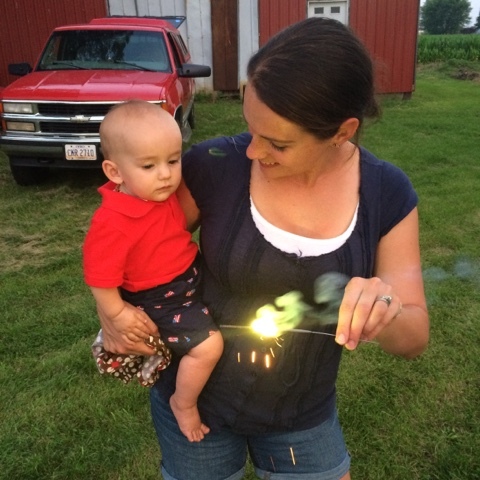 Logan absolutely melted my heart during the fireworks. He watched them for about a minute and then decided he did not like them. He let out the tiniest whimper then turned towards me, put his head on my shoulder, wrapped his arms around my neck and held on to me SO tight. And that was enough to comfort him. He did not cry or even make another peep. The louder they got, the tighter he held on and I felt so important in that moment. I can't even describe those warmest of fuzzies. I love all of my boys so much and we had a wonderful weekend together filled to the brim with quality time. We are already looking forward to next year. Flashback! Here's what we were up to one year ago today: "Gloomy Day"
Two years ago today: "Gloomy Day"
And three years ago today: "Let's Get Excited"
Oh to feel so loved. It only last so long, then they become teenagers and hate hugs by parents in public. Wish these babies would stay little forever. So bitter sweet. I hope next year he is no longer scared of fireworks. oh! I know that feeling and love it so much!